Sarah Greenough, “Alfred Stieglitz/A Street in Sterzing, The Tyrol/1890,” Alfred Stieglitz Key Set, NGA Online Editions, https://purl.org/nga/collection/artobject/35213 (accessed April 26, 2019). Of his visit to Sterzing, in the Austrian Tyrol, Stieglitz wrote: “no trace of rain was to be seen when I arrived in Sterzing, a small quaint village situated near Franzensfeste. Having heard of the queer streets in that place, I determined upon ‘skipping’ a train, and taking a look around. The streets are exceedingly picturesque, and the houses are the queerest bits of architecture my eye ever struck. The interiors would be a real ‘strike’ for painters like Defregger and Grützner. Unfortunately I had no flash light with me, and it was much too dark to try to photograph the interiors without; hence that pleasure was postponed for some future date. Upon my way to the train I passed through a street (!) 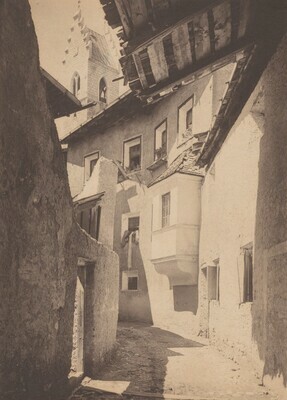 remarkable for its width” (“Cortina and Sterzing,” in Sun Pictures from Many Lands [London, 1892], 60–61). Greenough, Sarah, and Juan Hamilton. Alfred Stieglitz: Photographs and Writings. Washington, 1983: no. 6, pl. 7. Greenough, Sarah. Alfred Stieglitz: The Key Set: The Alfred Stieglitz Collection of Photographs. Washington, 2002: vol. 1, cat. 72.